After earning ₹26 crore (equivalent to ₹59 crore or US$8.2 million in 2018) for his role in Sivaji (2007), he was the highest-paid actor in Asia after Jackie Chan at the time. While working in other regional film industries of India, Rajinikanth has also appeared in the cinemas of other nations, including the American film Bloodstone (1988). As of 2018, Rajinikanth has won six Tamil Nadu State Film Awards—four Best Actor Awards and two Special Awards for Best Actor—and a Filmfare Best Tamil Actor Award. In addition to acting, he has also worked as a producer and screenwriter. Apart from his film career, he is also a philanthropist, spiritualist, and serves as an influence in Dravidian politics. Rajinikanth was born on 12 December 1950, in a Maratha family in Bangalore, Mysore State (present day Karnataka). His mother was a housewife,[a] and his father Ramoji Rao Gaekwad, a police constable, He was named Shivaji Rao Gaekwad after Chhatrapati Shivaji, a Maratha warrior King, and was brought up speaking Marathi at home and Kannada outside. Rajinikanth's ancestors hailed from Mavadi Kadepathar, Pune, Maharashtra and Nachikuppam, Krishnagiri district, Tamil Nadu. He is the youngest of four siblings in a family consisting of two elder brothers (Satyanarayana Rao and Nageshwara Rao) and a sister (Aswath Balubhai). After his father's retirement from work in 1956, the family moved to the suburb of Hanumantha nagar in Bangalore and built a house there. When he was nine years old, he lost his mother. Two years later, Rajinikanth signed up for P. Vasu's Chandramukhi (2005), a remake of the Malayalam film Manichitrathazhu. Upon release the film was highly successful at the box office, and in 2007 it set the record of being the longest running Tamil film. Chandramukhi was also dubbed in Turkish and in German as Der Geisterjäger and released in the respective nations. Following Chandramukhi's release, it was reported that AVM Productions was set to produce a film directed by Shankar starring Rajinikanth — the largest collaboration yet for a Tamil film. The film was titled Sivaji and was released in the summer of 2007, following two years of filming and production. It became the first Tamil film to be charted as one of the "top-ten best films" of the United Kingdom and South Africa box offices upon release. 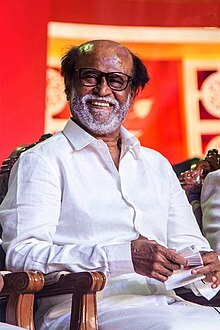 Rajinikanth received a salary of ₹26 crore (equivalent to ₹59 crore or US$8.2 million in 2018), for his role in the film, which made him the second highest-paid actor in Asia after Jackie Chan. During the production of Sivaji, Soundarya Rajinikanth announced her intention of producing a computer-generated imagery film starring an animated version of her father titled Sultan: The Warrior. The film was set for release in 2008, however, it entered development hell, and its development status would become unknown over the next few years. Rajinikanth worked again with Shankar for the science fiction film Enthiran. The film was released worldwide in 2010 as the most expensive Indian film ever made, ultimately becoming the second highest-grossing film in India of its time. Rajinikanth was paid a remuneration of ₹45 crore (equivalent to ₹75 crore or US$10 million in 2018) for the film. The film's success lead to the Indian Institute of Management Ahmedabad to use the film as a case study to analyse the business of cinema and its success story in a post-graduate elective management course called Contemporary Film Industry: A Business Perspective. The course would also study Muthu. Despite several failed attempts to restart Rana upon his return, Rajinikanth reprised his Enthiran character, Chitti, in the Bollywood science-fiction film Ra.One (2011) in a guest appearance alongside Shah Rukh Khan and Kareena Kapoor. In November 2011, it was decided that Rana would be shelved in favour of a new project with Rajinikanth, titled Kochadaiiyaan. The motion capture film, which is the first of its kind in India, was released in 2014 to positive reviews. Kochadaiiyaan, and the 3D release of Sivaji in 2012, made Rajinikanth the first Indian actor to have appeared in four different forms of world cinema: black-and-white, colour, 3D and motion capture. Following the completion of Kochadaiiyaan, Rajinikanth began work in Ravikumar's next directorial venture, titled Lingaa alongside Anushka Shetty and Sonakshi Sinha. The film was released on 12 December 2014, coinciding with his birthday, and received mixed reviews from critics. Rajinikanth's next film was director Pa. Ranjith's crime drama Kabali, produced by S. Thanu. The film was released in July 2016. Rajinikanth is filming for 2.0, a spiritual successor to Enthiran, that is under production since 2015 with no definite release date announced. In August 2016, it was announced that Rajinikanth and Ranjith would work together again for a film with Dhanush as producer, titled as Kaala, in which Rajinikanth plays a Dharavi-dwelling gangster who fights against corporate takeover of the slum. The film officially released on 7 June 2018. Rajinikanth upcoming film S. Shankar's 2.0 reprising the roles of Dr. Vaseegaran and Chitti, alongside Akshay Kumar and Amy Jackson. It is the spiritual successor to the 2010 Tamil film Enthiran and it the most expensive Indian film made to date. In 2019, Rajinikanth starred in Karthik Subbaraj's Petta, in which his performance received praise for his return to his vintage stereotypical style of acting. The combined gross earnings of Kaala, 2.0 and Petta by the end of January 2019 was determined to be over ₹1000 crore according to trade analysts. As of April 2019, Rajinikanth will be working with AR Murugadoss in the film Darbar, which is scheduled to release in 2020. In 1995, Rajinikanth began supporting the Indian National Congress after meeting Prime Minister P. V. Narasimha Rao. An opinion poll conducted by the magazine Kumudam predicted that Congress, with Rajinikanth's support, might win up to 130 seats in the Tamil Nadu Assembly. In 1996, when the Congress Party decided to align with All India Anna Dravida Munnetra Kazhagam (AIADMK) for the assembly election in Tamil Nadu, Rajinikanth changed loyalties and supported the Dravida Munnetra Kazhagam (DMK)-Tamil Maanila Congress (TMC) alliance. The TMC used a bicycle as their election symbol and used an image of Rajinikanth riding a bicycle from the film Annamalai in their posters. Rajinikanth said: "Even God cannot save Tamil Nadu if AIADMK returns to power." Rajinikanth wholeheartedly supported the DMK and TMC alliance and asked the people of Tamil Nadu and his fans to vote for that alliance. This alliance had a complete victory in 1996. Rajinikanth also supported the DMK-TMC alliance in the parliamentary election, held the same year. Later in 2004, Rajinikanth said he would personally vote for the Bharatiya Janata Party (BJP) but would not extend his support to any front during the upcoming Indian general election. The party, however, failed to win any seats in Tamil Nadu in the Lok Sabha. Critics, such as Cho Ramaswamy, have commented that Rajinikanth has the potential to be successful in Indian politics due to his popularity and fan base alone. Since Rajinikanth's influence in the 1996 election, many of his fans in Tamil Nadu called for his entry in politics, particularly for him to contest for Chief Minister of the state. Rajinikanth announced entry into politics on 31 December 2017 and confirmed his intention to contest in the 2021 Tamil Nadu Legislative Assembly elections in all 234 constituencies. He stated that his party would resign if it was unable to fulfill its electoral promises within three years of coming into power. Rajinikanth is a follower of Hinduism, spiritualism, and a strong believer of spirituality. He is also a practitioner of yoga and meditation. Rajinikanth has religiously visited major Hindu temples prior to the release of each of his films; for instance he visited the Tirumala Venkateswara Temple before the release of Sivaji in 2007 and visited Sathya Sai Baba at Prasanthi Nilayam in Andhra Pradesh before the release of Kuselan the following year. He also occasionally leaves for pilgrimage to the Himalayas. He has often referred to Ramakrishna Paramahamsa, Swami Satchidananda, Ragavendra Swami, Mahavatar Babaji, and Ramana Maharishi as his favourite spiritual leaders. According to Naman Ramachandran, the author of Rajinikanth: The Definitive Biography, most of Rajinikanth's philanthropic activities went unpublicised because he chose to keep them undisclosed. In the 1980s, when superstitious beliefs in Tamil Nadu created a stigma towards eye donation, Rajinikanth took the case of campaigning in support of corneal transplantation via television and public speeches. In 2011, Rajinikanth announced his support for the anti-corruption movement led by Anna Hazare and offered his commercial wedding venue, the Raghavendra Kalyana Mandapam, in Chennai free of cost for the India Against Corruption members to hold their fast. Rajinikanth's fan associations regularly organise blood donation and eye donation camps and distribute food during his birthday. ^ While Naman Ramachandran's 2012 biography of Rajinikanth identifies his mother's name as Ramabai, journalist Ramachandra Rao, a childhood friend of the actor, said in 2012 that her name was Jijabai. ^ a b c d "How Shivaji became Rajinikanth". Rediff.com. Archived from the original on 6 October 2014. Retrieved 4 October 2014. ^ "Rajinikanth gets Padma Vibhushan; Padma Shri for Priyanka, Ajay Devgn". The Indian Express. New Delhi. 26 January 2014. Archived from the original on 25 October 2016. Retrieved 8 December 2016. ^ a b c d e Ramachandran 2012, chpt. Introduction. ^ Ruma Singh (6 July 2007). "Even more acclaim will come his way". The Times of India. Archived from the original on 16 February 2012. Retrieved 20 April 2011. ^ "Tracing 'Kabali's' Rajinikanth & his link to Shivaji". The Economic Times. 22 July 2016. Archived from the original on 11 April 2017. Retrieved 11 April 2017. ^ "Rajinikanth invited for Saswad literary meeting". Daily News and Analysis. 31 December 2013. Archived from the original on 23 January 2014. Retrieved 5 February 2014. ^ "Rajini creates drinking water facility in his parents' memory". 28 April 2009 – via www.thehindu.com. ^ "Biographical article about Superstar Rajini Kanth". www.tamilstar.com. Tamil Star Inc. Archived from the original on 6 October 2014. Retrieved 4 October 2014. ^ S, Anandan (6 January 2013). "Reel to real image, a tome". The Hindu. Archived from the original on 28 June 2013. Retrieved 22 February 2013. ^ "Rajini's friends to renovate primary school". Sify. 13 December 2010. Archived from the original on 5 December 2013. Retrieved 9 July 2011. ^ a b Ramachandran 2012, chpt. 1. ^ a b Lakhe, Manisha (27 September 2010). "Why Rajinikanth Rocks". Forbes. Archived from the original on 27 March 2015. Retrieved 9 April 2011. ^ "1. Struggle is a stepping stone". Rediff.com. 12 December 2012. Archived from the original on 4 February 2014. Retrieved 5 February 2014. ^ M. D, Riti (22 December 1999). "You can see God in him at times". Rediff.com. Archived from the original on 6 October 2014. Retrieved 14 June 2011. ^ a b "திரைப்படக் கல்லூரியில் 2 ஆண்டு நடிப்பு பயிற்சி". Maalai Malar (in Tamil). 2 February 2009. Retrieved 6 February 2014. ^ K. V. Subramanya (16 June 2007). "He drove Rajnikant to stardom". The Hindu. Chennai, India. Archived from the original on 7 November 2010. Retrieved 4 November 2010. ^ "Meet the bus driver Rajni worked with". Rediff.com. 13 June 2007. Archived from the original on 6 November 2014. Retrieved 9 September 2010. ^ N.S., Ramnath; D'Souza, Nilofer (22 December 2010). "Rajinikanth: Who Really Is the Super Star? (Anand iya Vaalka)". Forbes. Archived from the original on 18 April 2015. Retrieved 22 February 2013. ^ Hindu 2012, p. 12. ^ a b Sathyalaya Ramakrishnan (13 December 2010). "Super Star Rajnikanth turns 61: Fans celebrates enthusiastically". Asian Tribune. Archived from the original on 15 December 2010. Retrieved 18 June 2011. ^ Ramachandran, Naman (5 January 2014). "The other Rajinikanth". The Pioneer. Archived from the original on 18 April 2015. Retrieved 5 February 2014. ^ C Raja Mohan (12 December 2010). "Fans celebrate Rajinikanth's 61st birthday". The Indian Express. Archived from the original on 20 January 2011. Retrieved 23 April 2011. ^ "Experiments in Tamil cinema — Apoorva Raagangal (1975)". The Times of India. Archived from the original on 9 May 2015. Retrieved 5 February 2014. ^ "23rd National Film Awards" (PDF). Directorate of Film Festivals. Archived from the original (PDF) on 26 May 2011. Retrieved 23 April 2011. ^ Hindu 2012, p. 67. ^ "Blast from the past: Naagarahaavu- 1972". The Hindu. 18 October 2008. Archived from the original on 10 November 2012. Retrieved 5 February 2014. ^ a b c d e Ramachandran 2012, chpt. 3. ^ a b Ramachandran 2012, chpt. 4. ^ Chamikutty, Preethi (19 December 2012). "Mirinda advertisement: Can Asin match the charisma of Rajinikanth, Sridevi and Kamal Hassan". The Economic Times. Retrieved 7 February 2014. ^ Malathi Rangarajan (10 April 2011). "We will miss you, Sujatha". The Hindu. Chennai, India. Archived from the original on 10 August 2011. Retrieved 23 April 2011. ^ "Return of Rajinikanth". The Hindustan Times. 22 February 2012. Archived from the original on 5 February 2014. Retrieved 5 February 2014. ^ "Success has humble beginnings". Rediff.com. 12 December 2012. Archived from the original on 25 February 2013. Retrieved 24 February 2013. ^ Srinivasan, Meera (4 September 2010). "Fusion of culture at celebrity wedding". The Hindu. Archived from the original on 20 October 2011. Retrieved 22 February 2013. ^ a b c d e Rajitha (22 December 1999). "Rajini acts in front of the camera, never behind it". Rediff.com. Archived from the original on 7 January 2017. Retrieved 14 June 2011. ^ Ramachandran 2012, chpt. 5. ^ Sreekanth 2008, p. 370. ^ Ramachandran 2012, chpt. 6. ^ Sreekanth 2008, pp. 369–370. ^ "40 years of Superstar Rajinikanth: His top movies". India TV. 19 August 2015. Archived from the original on 3 July 2015. ^ a b c d e f Ramachandran 2012, chap. 6. ^ "சூப்பர் ஸ்டார் பட்டம் எனக்கு வேண்டாம்! : ஏற்க மறுத்தார், ரஜினிகாந்த்!". Maalai Malar (in Tamil). 28 October 2012. Archived from the original on 18 March 2013. Retrieved 12 February 2014. ^ D. Karthikeyan (13 December 2009). "A phenomenon called Rajnikanth". The Hindu. Archived from the original on 15 October 2013. Retrieved 22 February 2013. ^ "Amitabh is my inspiration, says Rajini". The Hindu. 15 August 2010. ^ a b Jha, Lata (18 July 2016). "10 Rajinikanth films that were remakes of Amitabh Bachchan starrers". Mint. ^ a b "What do Amitabh Bachchan and Rajinikanth have in common?". Catch News. 23 July 2016. ^ a b Girija Jinnaa (15 June 2007). "'Yesterday I was a conductor, today I'm a star'". The Indian Express. Archived from the original on 17 June 2007. Retrieved 4 January 2011. ^ "Rajanikant: His name spells box-office magic in the south". India Today. 31 July 1988. ^ "Return of Rajinikanth". The Hindustan Times. 22 February 2012. Archived from the original on 10 February 2014. Retrieved 10 February 2014. ^ "10 Rajinikanth films that were remakes of Amitabh Bachchan starrers". Archived from the original on 19 July 2016. ^ a b Srinivasan, Meera (29 January 2011). "Raana Rajini's next venture". The Hindu. Archived from the original on 10 November 2012. Retrieved 24 February 2013. ^ a b "The Rajini mystique". The Hindu. 2 July 2011. Archived from the original on 25 December 2014. Retrieved 6 July 2011. ^ "Top Earners 1980–1989 (Figures in Ind Rs)". Box Office India. Archived from the original on 14 October 2013. Retrieved 22 February 2013. ^ "Only Rajini can". The Economic Times. 10 December 2006. Archived from the original on 19 October 2012. Retrieved 21 February 2011. ^ a b Collections. Update Video Publication. 1991. p. 394. Archived from the original on 3 December 2013. ^ a b K. Hariharan (24 October 2010). "Magazine : He's back". The Hindu. Archived from the original on 28 October 2010. Retrieved 23 April 2011. ^ "PHOTOS: Rajinikanth's tryst with Bollywood: Hum, Andha Kanoon, Chaalbaaz | The Indian Express". indianexpress.com. Archived from the original on 27 June 2014. Retrieved 28 June 2014. ^ Ramachandran 2012, chap. The 1980s. ^ Weldon, Michael (1996). The Psychotronic Video Guide. Titan Books. p. 66. ISBN 978-1-85286-770-6. Archived from the original on 3 December 2013. Retrieved 22 February 2013. ^ Ramachandran 2012, p. 127. ^ S.R. Ashok Kumar (14 May 2004). "Finger on people's pulse". The Hindu. Archived from the original on 21 February 2015. Retrieved 28 April 2011. ^ "It's India-Japan Friendship Year". The Hindu (in Tamil). Chennai, India. 15 December 2006. Archived from the original on 20 May 2007. Retrieved 20 April 2007. ^ a b "Looking at Mani Ratnam's landmark movies – Rediff.com Movies". Rediff.com. 9 June 2010. Archived from the original on 6 October 2014. Retrieved 30 May 2011. ^ "Tamil superstar Rajnikant turns 60, fans celebrate". The Indian Express. 12 December 2009. Archived from the original on 26 March 2010. Retrieved 23 April 2011. ^ Megha Shenoy (4 April 2011). "Inspiration for remakes". The Deccan Herald. Archived from the original on 21 October 2012. Retrieved 26 February 2013. ^ "Working with Rajinikanth: Baasha director tells all". Rediff.com. 12 December 2012. Archived from the original on 8 February 2013. Retrieved 26 February 2013. ^ Pillai, Sreedhar (17 February 2009). "Rajinikanth: Old is gold". The Times of India. Archived from the original on 14 January 2016. Retrieved 9 October 2013. ^ "Happy birthday, Rajinikanth!". Mid Day. Archived from the original on 14 October 2013. Retrieved 9 October 2013. ^ S Saroj Kumar (4 January 2012). "Brand Rajinikanth". The Financial Express. Archived from the original on 6 October 2014. Retrieved 9 October 2013. ^ "Dancing Maharajas". Archived 25 November 2010 at the Wayback Machine Newsweek. 10 May 1999. ^ Prem Panicker (14 December 2006). "When the PM wowed Japan's parliament". Rediff.com. Archived from the original on 5 August 2012. Retrieved 8 January 2012. ^ a b Rangarajan, Malathi (16 August 2002). "Baba". The Hindu. Archived from the original on 25 December 2014. Retrieved 24 February 2013. ^ N Sathiya Moorthy (3 May 2003). "Film producer GV commits suicide". Rediff.com. Archived from the original on 7 January 2017. Retrieved 17 May 2007. ^ Sudhish Kamath (12 May 2004). "Superstar wannabes". Chennai, India: The Hindu: Metro Plus. Archived from the original on 1 October 2007. Retrieved 17 May 2007. ^ "Will Sivaji be Rajini's biggest hit?- History". Rediff.com. Archived from the original on 7 June 2007. Retrieved 6 May 2007. ^ "Rajini keeps everyone guessing". 23 March 2004. Archived from the original on 9 March 2007. Retrieved 5 April 2007. ^ "The Final Verdict – History". Sify. 8 May 2005. Archived from the original on 24 December 2014. Retrieved 24 February 2013. ^ "Rajni's 'Chandramukhi' in Turkish and German". Oneindia.in. 2 April 2006. Archived from the original on 26 October 2014. Retrieved 7 June 2011. ^ "United Kingdom Box Office June 15–17, 2007". Box Office Mojo. Archived from the original on 26 June 2007. Retrieved 18 June 2007. ^ "South Africa Box Office August 3–5, 2007". Box Office Mojo. Archived from the original on 24 October 2007. Retrieved 8 June 2007. ^ Sharma, Neha (29 September 2010). "Rapchik Rajinikanth, mind it!". The Hindustan Times. Archived from the original on 24 December 2014. Retrieved 9 October 2013. ^ Varma, Anuradha (17 October 2010). "What makes Rajinikanth the Boss?". The Times of India. Retrieved 13 February 2014. ^ Vilakudy, Rajaneesh (5 November 2006). "After Brangelina, it's Rajinikanth". Daily News and Analysis. Archived from the original on 14 October 2013. Retrieved 9 October 2013. ^ "Rajinikanth's Sultan rechristened as Hara". OneIndia. 25 October 2010. Retrieved 27 March 2011. ^ "Animated film on Rajnikant to be released in December 2008". The Economic Times. 13 December 2007. Retrieved 9 October 2013. ^ Ramanujam, Srinivas (29 April 2012). "The day Rajini took ill". The Times of India. Retrieved 9 October 2013. ^ "Rajinikanth in Endhiran". Rediff.com. 14 December 2010. Archived from the original on 27 May 2011. Retrieved 12 July 2011. ^ P, Krishnakumar (1 August 2008). "Pasupathy, the real star of Kuselan". Rediff.com. Rediff. Archived from the original on 2 August 2011. Retrieved 12 June 2011. ^ Pillai, Sreedhar (20 August 2008). "Kollywood in a flap". The Times of India. Retrieved 24 February 2013. ^ Iyengar, Pushpa. "Hope Floats For SRK". The Outlook. Archived from the original on 28 October 2011. Retrieved 30 July 2011. ^ S, Shyam Prasad (16 December 2008). "Kuselan may spark Tamil film boycott". Bangalore Mirror. Archived from the original on 24 May 2013. Retrieved 24 February 2013. ^ Gupta, Shubhra (26 December 2010). "Chulbul Pandey Now Lives in Chennai". The Indian Express. Archived from the original on 11 February 2011. Retrieved 2 January 2012. ^ "Is It True That Endhiran Will Gross Than Three Idiots?". Box Office India. Archived from the original on 6 October 2010. Retrieved 24 February 2013. ^ "Rajini's Endhiran: A sell out in Chennai". NDTV. Archived from the original on 6 November 2012. Retrieved 26 September 2010. ^ "Endhiran — The Robot Expected Lifetime Business". Box Office India. 1 November 2010. Archived from the original on 16 February 2013. Retrieved 4 January 2011. ^ "Avatar technology powers Rajnikant in Enthiran". The Indian Express. 28 August 2010. Archived from the original on 24 November 2010. Retrieved 24 February 2013. ^ "Rajinikanth's Enthiran – Case study in IIM A". Times of India. India. 23 December 2010. Retrieved 9 April 2011. ^ "Rajinikanth admitted to hospital – Entertainment – DNA". Daily News and Analysis. 29 April 2011. Archived from the original on 18 August 2011. Retrieved 14 July 2011. ^ "Rajinikanth hospitalised". Sify. Archived from the original on 11 August 2011. Retrieved 1 July 2011. ^ ITGD Bureau (14 May 2011). "Actor Rajinikanth hospitalised again". India Today. Archived from the original on 14 October 2013. Retrieved 1 July 2011. ^ "Rajini writes letter to fans, says he will be back soon". The Hindustan Times. 18 June 2011. Archived from the original on 21 June 2011. Retrieved 1 July 2011. ^ a b "Rajinikanth's Condition Stable: Hospital". NDTV. Archived from the original on 10 February 2014. Retrieved 1 July 2011. ^ "Modi To Visit Rajini in Hospital". NDTV. Archived from the original on 16 December 2013. Retrieved 1 July 2011. ^ "Rajini will soon be back to complete 'Raana': Dhanush". The Times of India. 1 June 2011. Retrieved 1 July 2011. ^ "Rajinikanth out of ICU, moved into private ward – Times of India". The Times of India. 23 May 2011. Retrieved 1 July 2011. ^ "Rajini getting better, say docs as fans pray for their superstar". The Times of India. 6 May 2011. Retrieved 1 July 2011. ^ "Rajini suffering from lung, liver ailment: Brother". NDTV. 17 May 2011. Archived from the original on 20 May 2011. Retrieved 1 July 2011. ^ "International news of the week". Business Standard. 4 June 2011. Archived from the original on 20 June 2013. Retrieved 17 February 2013. ^ "Rajini in Singapore hospital on Big B's advice". Zee News. 30 May 2011. Archived from the original on 12 July 2011. Retrieved 14 July 2011. ^ "Rajnikanth fine, recovering well: Dhanush". The Hindu. 31 May 2011. Archived from the original on 15 October 2013. Retrieved 9 October 2013. ^ "Rajinikanth to return tonight". 14 July 2011. Archived from the original on 2 November 2013. Retrieved 9 October 2013. ^ Rudrappa, Chetan (16 September 2011). "Rajinikanth's cameo RA.One". The Times of India. Retrieved 2 October 2011. ^ "'Kochadaiiyaan' Review Roundup: Commendable Attempt by Soundarya; Worth Watching". International Business Times. 23 May 2014. Archived from the original on 7 January 2017. Retrieved 24 May 2014. ^ "Movie Review: Rajinikanth's Sivaji 3D". IANS. NDTV. 11 December 2012. Archived from the original on 27 May 2014. Retrieved 14 April 2014. ^ "Rajini 'Cannes'". Deccan Chronicle. 3 April 2013. Archived from the original on 10 March 2014. Retrieved 10 March 2014. ^ "Sona presses the rewind button". Mumbai Mirror. 28 April 2014. Archived from the original on 1 October 2014. Retrieved 2 May 2014. ^ "Superstar Rajinikanth's next is Lingaa". The Hindu. 29 April 2014. Archived from the original on 20 September 2014. Retrieved 2 May 2014. ^ "'Lingaa' Stamped with 'U' Rating; Rajinikanth Starrer Confirmed for 12 December Release". International Business Times. 26 November 2014. Archived from the original on 20 February 2015. Retrieved 1 December 2014. ^ "I take responsibility for the book scene in Lingaa: KS Ravikumar". The Times of India. 21 December 2014. Archived from the original on 25 December 2014. Retrieved 29 December 2014. ^ "Kabali review round-up: This is what critics are saying about the Rajinikanth blockbuster". Daily News and Analysis. 22 July 2016. Archived from the original on 25 July 2016. Retrieved 25 July 2016. ^ "Rajinikanth's 'Kabali' magic mesmerises Mumbai". The Indian Express. 22 July 2016. Archived from the original on 23 July 2016. Retrieved 25 July 2016. ^ Rajinikanth-Ranjith combo under Dhanush's production soon Archived 30 August 2016 at the Wayback Machine. The Hindu (29 August 2016). Retrieved on 3 November 2016. ^ "Tamil Cinema 1998-Year Highlights (Part-2)". Dinakaran. 21 January 1998. Archived from the original on 20 June 2008. Retrieved 23 September 2009. ^ "'Rajnikanth is a firm believer in Hindutva'". Rediff. 28 April 2004. Archived from the original on 30 May 2013. Retrieved 12 June 2013. ^ "AIADMK entering Parliament after five years". The Times of India. 17 May 2009. ^ "Rajnimanth joins politics and announced a new party". NDTV. 31 December 2017. ^ "Top 12 Rajinikanth jokes". The Times of India. 5 December 2013. Retrieved 5 February 2014. ^ "Happy Birthday: A Look Inside Rajinikanth'S Luxury Home In Pune". Dainik Bhaskar. Archived from the original on 16 December 2013. Retrieved 5 February 2014. ^ "Who rules South Cinema – Rajinikanth or Kamal Haasan?". Breakingnewsonline.net. 28 September 2010. Archived from the original on 23 July 2011. Retrieved 20 April 2011. ^ Hendrix, Grady (27 September 2010). "SUPERSTAR Rajinikanth! : The biggest movie star you've probably never heard of. – By Grady Hendrix – Slate Magazine". Slate.com. Archived from the original on 15 March 2011. Retrieved 20 April 2011. ^ "Rajini's Punch dialogues". thesouthreports.com. Archived from the original on 25 March 2011. Retrieved 12 April 2011. ^ "It doesn't get bigger than Rajinikanth". Times of India. India. 18 April 2008. Retrieved 12 April 2011. ^ S.R, Ashok Kumar (20 July 2007). "Determined to make a mark, again". The Hindu. Archived from the original on 15 October 2013. Retrieved 24 February 2013. ^ Moviebuzz. "Ghajini was a big mistake!". Sify. Archived from the original on 2 October 2012. Retrieved 24 February 2013. ^ "CBSE students to now study Rajinikanth's life story". The Times of India. 17 December 2012. Archived from the original on 2 May 2016. Retrieved 25 November 2015. ^ Varuni, Khosla (7 May 2014). "Superstar Rajinikanth proves his might again, notches over 2.4 lakh followers on Twitter debut". The Economic Times. Archived from the original on 10 May 2014. Retrieved 10 June 2014. ^ "Venice Review: 'For the Love of a Man' Portrays the Biggest Movie Star You've Never Heard Of". Indiewire. 5 September 2015. Archived from the original on 4 February 2016. Retrieved 5 February 2016. ^ "Rediff India News: Rajinikanth fasts for Kaveri waters". Rediff.com. 13 October 2002. Archived from the original on 30 April 2009. Retrieved 23 September 2009. ^ "Rediff India News:Rajinikanth to meet Indian PM". Rediff. 14 October 2002. Archived from the original on 30 April 2009. Retrieved 23 September 2009. ^ "Rally exposes politicised film industry". 12 October 2002. Archived from the original on 2 November 2007. Retrieved 5 April 2007. ^ "Rajnikanth blasts Karnataka over water project – Thaindian News". Thaindian.com. Archived from the original on 4 May 2009. Retrieved 23 September 2009. ^ a b "Karnataka groups demand apology". Sify. 5 April 2008. Archived from the original on 31 March 2014. Retrieved 23 September 2009. ^ "Rajini earns the wrath of Tamil cinema". Behindwoods. Archived from the original on 10 April 2010. Retrieved 9 September 2010. ^ "Karunanidhi against bringing politics into film world: The Hindu". Chennai, India: The Hindu. 7 February 2010. Archived from the original on 16 June 2010. Retrieved 18 October 2010. ^ "Rajinikanth: Anger after actor justifies deadly police firing". Retrieved 3 June 2018. ^ "Rajinikanth blames anti-social elements for Sterlite protest". ^ "Superstar Rajinikanth apologises for losing cool at media interaction". Retrieved 3 June 2018. ^ "Rajinikanth's speech earns him negative image on social media?". Retrieved 3 June 2018. ^ Ramachandran 2012, chpt. The 1980s. ^ "At 62: Rajinikanth on his marriage, Kamal and Sivaji". First Post. 12 December 2012. Archived from the original on 16 March 2014. Retrieved 5 February 2014. ^ "Rajini's personal life". weeksupdate.com. Archived from the original on 15 July 2011. Retrieved 28 March 2011. ^ "Dhanush's son named Linga – Tamil Movie News". IndiaGlitz. Archived from the original on 12 October 2010. Retrieved 6 October 2010. ^ "Tamil Nadu / Chennai News : Rajnikanth turns grandfather". The Hindu. 12 October 2006. Archived from the original on 24 September 2009. Retrieved 10 April 2010. ^ Gladwin Emanuel (4 September 2010). "Soundarya Rajinikanth's celeb-studded wedding". The Times of India. Retrieved 9 September 2010. ^ "Rajnikanth is a firm believer in Hindutva". Rediff.com. 28 April 2004. Archived from the original on 30 May 2013. Retrieved 22 February 2013. ^ "Andhra Pradesh / Anantapur News : Rajinikanth in Puttaparthi". The Hindu. 14 April 2008. Archived from the original on 3 November 2010. Retrieved 9 September 2010. ^ Ramanujam, Srinivasa (21 August 2011). "Rajinikanth love Himalayas". The Times of India. Retrieved 24 February 2013. ^ a b "Why does Rajini dwell in the hearts of millions?". cinefundas.com. 1 June 2011. Archived from the original on 4 June 2011. Retrieved 15 June 2011. ^ "Rajini blesses "Mahaan" actor". Indiaglitz.com. 22 September 2010. Archived from the original on 18 November 2010. Retrieved 15 June 2011. ^ "Rajini's tribute to Babaji". Indiaglitz.com. 10 May 2008. Archived from the original on 23 October 2012. Retrieved 15 June 2011. ^ Manoj Thulasi (23 October 2011). Rajnikanth in Eye Donation Campaign (Television production). YouTube. Retrieved 10 June 2014. ^ "Actor Rajinikanth supports Anna Hazare". The Times of India. 23 August 2011. ^ "Rajinikanth lends wedding hall for anti-corruption fast: Team Anna". Daily News and Analysis. 26 December 2011. Archived from the original on 2 November 2012. Retrieved 24 February 2013. ^ "Rajinikanth has a quiet birthday". 12 December 2013. Archived from the original on 8 May 2014. Retrieved 12 December 2013. ^ a b Ramachandran 2012, chpt. Awards. ^ "Rajnikanth". Koimoi. Archived from the original on 31 December 2013. Retrieved 13 February 2014. ^ "Civilian Awards announced on 26 January 2000" (in Tamil). Ministry of Home Affairs (India). Archived from the original on 2 March 2007. Retrieved 20 April 2007. 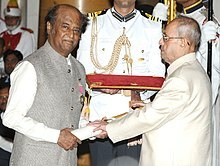 ^ "Padma Vibhushan for Rajinikanth, Dhirubhai Ambani, Jagmohan". The Hindu. 25 January 2016. Archived from the original on 25 January 2016. Retrieved 25 January 2016. ^ "Indian Entertainer of the year". itimes.com. Archived from the original on 7 October 2011. Retrieved 28 March 2011. ^ "Air supply". The Hindu. 18 June 2010. Archived from the original on 15 October 2013. Retrieved 24 February 2013. ^ Buncombe, Andrew (3 October 2010). "Meet India's biggest film star". The Independent. London. Archived from the original on 22 January 2015. Retrieved 3 October 2010. ^ "Now, a film on Rajinikanth's life". The Times of India. 4 May 2011. Retrieved 4 May 2011. ^ "Rajinikanth is the Entertainer of the decade". Sify. 31 May 2010. Archived from the original on 19 February 2011. Retrieved 9 September 2010. ^ "Rajinikanth conferred Centenary Award at IFFI". The Hindu. 20 November 2014. Archived from the original on 28 November 2014. Retrieved 20 November 2014. ^ "IFFI 2014: Stalwarts Amitabh Bachchan, Rajinikanth in opening act". Daily News and Analysis. 20 November 2014. Archived from the original on 22 November 2014. Retrieved 20 November 2014.